2. A box with the main options will open up. We select Print. 3. A control box with Printing options will open up. 4. We select the printer from the available options. In order to be able to do this, remember that the corresponding printer needs to be properly installed. 5. 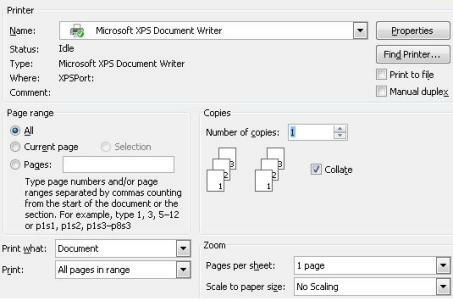 Another section found in this box is the identification of Page range for the document we need to print. We can print All the document, the Current page of the document (the page in which the cursor is found at the moment), or specific Pages. .
6. If we need to print a specific group of pages, we click on Pages and we specify the pages we want to print. Notice the use of "comma" or "hyphen" between numbers. If we use a hyphen, we are selecting all pages between 1 and 4. If we use a comma, we are only selecting pages 1 and 4. 8. Finally, we click on "OK" and we just need to wait for the printing to be done.